normally I only make this when the local peaches are in season. as an experiment in "will they still be good?" - last year year I bought a basket of ripe ready peaches, peeled, sliced and froze in a thin layer. this is the completion of that experiment - and with a modern -10F' / -23'C freezer, it works quite well - the peaches are superb - not freezer mushy. I did drain any free liquid prior to using in this recipe. the batter should be a bit crusty - the brown sugar will make a 'near' caramel topping. a dollop of whip cream and you're set! Thanks Dilbert. Looks easy, quick and deliciious. "one cup (105 g) brown sugar"
Could you have made a mistake? brown sugar "packing" will affect it drastically - perhaps I didn't squish it so hard? correcting . . . .
btw, did this last week with fresh blueberries - worked well. I used an entire pint (BOGOF) and I think I'd cut that back some. I hate to complain but something went really wrong. Only deviations from your recipe were using Safeway frozen peaches (which are quite good, BTW) and a 10" soufleé pan instead of a 9x9 baking dish. The dough/cakey part didn't rise or expand at all -- just remained a soupy mess. sounds like the baking powder may have been DOA...? peaches completely thawed? drained - too much free liquid? the batter is on the thin side, not like a biscuit or bread. 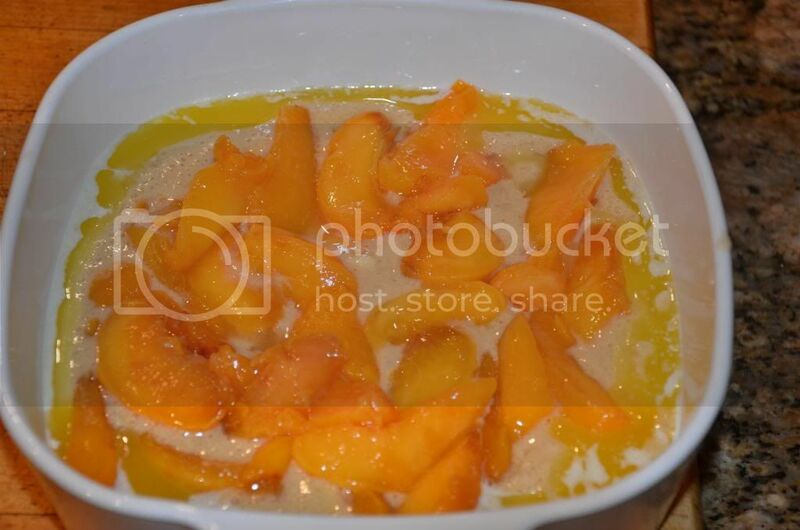 Baking powder was a freshly opened can, peaches thawed, macerated, drained. I'll try again sometime with a little less butter, a lot less sugar and a little more flour. 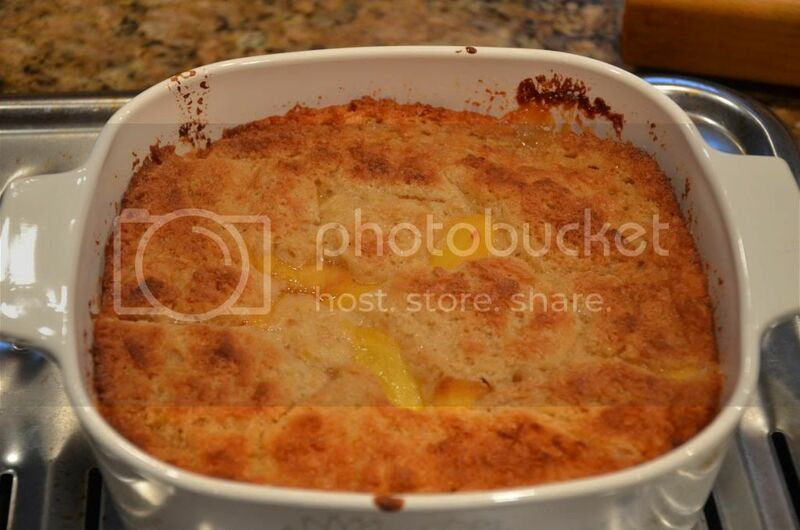 Okay, I'll admit the baking powder had an expiration date of Nov 2013, but I only broke the factory seal when I made the cobbler. Can baking powder go bad even if it's hermetically sealed? wouldn't be my first guess - but might be. storage conditions are a factor, even sealed. the batter is so simple - flour, milk, baking powder & sugar.... mix & pour, not a lot to go wrong with "technique," etc. one "way out" thing - if the peaches were "treated" for color preservation and what all else - and that chemical/additive interfered with the bp. most of the color preservatives are acid in nature, and acid makes baking powder go 'more better' - so somewhat an unlikely cause - which leaves the bp. I'd go with some fresh bp. I date my cans when I open them and toss after six months regardless of it's 'use by date' - once opened they pick up moisture, etc. - and I'm not fond of opening the oven to find a flat . . .
akkk. this full / half batch recipe thing is gonna drive me nuts. yes, I'll edit the orig - should be 210g (by my measure) for a full cup of brown sugar. LOL, this recipe is all over the place! Oddly enough, I bought another package of Safeway frozen peaches yesterday to try it again. I note that ingredients list ascorbic, malic, and citric acids as "preservatives" and can confirm the peaches ARE rather tart. Could this be counteracting the effect of the baking soda? baking powder reacts with acids to go foamy. old fashion single acting only foamed at acid blend. new fangled double acting gases at acid blend plus stage 2 on heat. Well, I'll try again in a few days. I suspect the baking powder has gone off, but will adjust flour and sugar according to my sensibilities. I did manage to scare up a Corning 9x9 just like yours, so we'll see how it comes out.